This what it feels like when somehow you beat the best Smash 4 player in the world with a miraculous, last minute combo. The kid who can’t believe his eyes as he slides off his headset is Luhtie, a relatively unknown player who mains Zero Suit Samus and has never won a major Smash tournament. But today he did something even better than that. 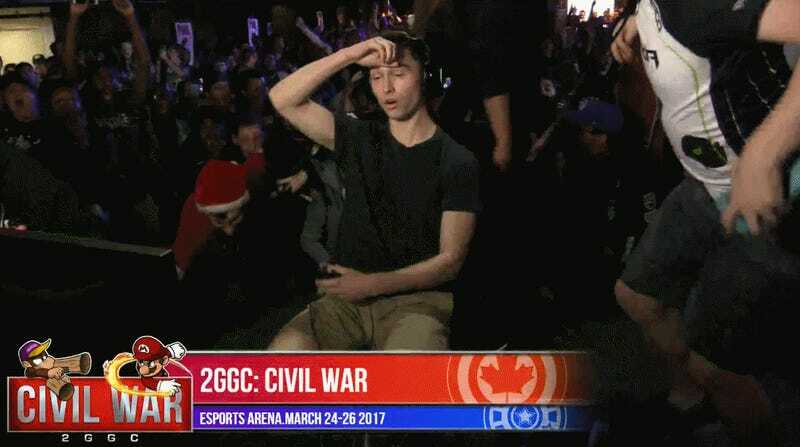 Even if he doesn’t go on to win 2GGC: Civil War, which he still likely will did not, Luhtie will leave this weekend as the person who gave superstar Gonzalo “ZeRo” Barrios his lowest placement in a tournament ever by far, sending the champ packing at 49th. Friend and mentee Nairo said ZeRo looked like he was playing without confidence, but anyone would be hard pressed to assert themselves against an opponent with counter-attack combos as punishing as Luhtie’s. It was a best-of-five series that went back and forth throughout, but what kept the Samus player in the money were devastating onslaughts in the air like these. It was all he could do to keep the veteran from edging him out early. As a result, Luhtie survived until the last stock of the last match. At 138% damage, death was imminent if not inevitable. And then the unthinkable happened. Playing dangerously, ZeRo tried to recover from lunging at Luhtie and missing, only to find himself compromised and exposed. 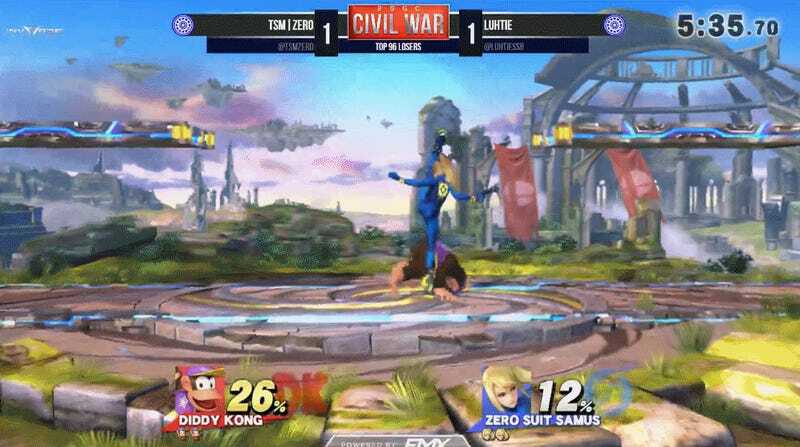 Luhtie pounced immediately, and sent ZeRo hurtling off the top of the stage at only 54% damage when his opponent’s iconic Diddy Kong would normally still be safe. While it was a moment of shocking euphoria for Luhtie, ZeRo appeared more defeated in the aftermath of the bout than you’d expect from someone with so many commanding first place finishes under his belt. Of course, his fans weren’t having it, giving him their complete support and encouraging him to take a step back from social media while he grapples with the disappointment and to shrug off any of the people online or at the event who immediately took the stumble as an opportunity to make fun of him. Some jokingly chalked up Luhtie’s win to karma catching up with ZeRo for taunting after the 3-0 stomping he gave a player in the series immediately prior.